While attending the North Sydney Genealogy Help Desk last Friday I was told that Fairfax has now made transcriptions of their newspaper articles from 1990 to 2014 freely available on the internet. This includes Birth Death and Marriage notices. Fairfax Media Limited publications include The Sydney Morning Herald, The Age and others. To search these newspapers you go to the Newsstore website, and do an advanced search, choosing Births, Deaths or Marriages from the drop down menu under ‘Section’. 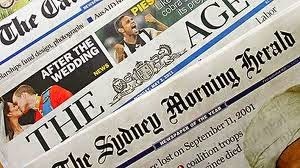 This now means that The Sydney Morning Herald can be searched, in it’s entirety, for free from home. Two other websites cover the rest of the paper. One of the State Library’s eresources has the Sydney Morning Herald and Sun Herald from 1955 to 1995. You need to be a State Library member to access this. If you are not a member you can join online, but you have to be a NSW resident. This eresource database is very good. It has photographed pages of the newspapers which can be searched with keywords (by OCR). Problems I have found with it are that it takes a long time to do a search and the text of the BDM records is tiny. 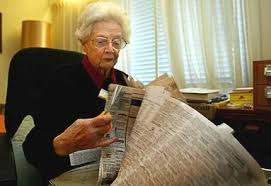 Finding your ancestor’s record on the page needs exceptional eyesight or a magnifying glass. Printing can be a bit tricky too as it prints chunks of records rather than just the one you want. Most people know the Trove website covers the rest of the SMH from 1831 to 1955. When you can access the entire newspaper for free you can see how the normal ‘business model’ for newspapers is changing and many are going broke. This certainly makes it a lot cheaper and easier for genealogists. If you are looking for a death notice these would be your second port of call after visiting the Ryerson Index website and finding the date and newspaper that your ancestor’s record appears in.